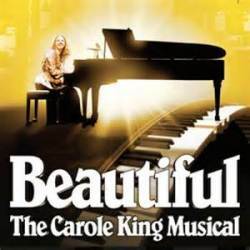 “Beautiful—The Carole King Musical”, which opened at the Broward Center for the Performing Arts in Fort Lauderdale, is a beautiful musical! From the cast of 25 actors/singers/dancers to the 13 musicians conducted by Susan Draus to the precise direction of Marc Bruni, the choreography by Josh Prince, the fluid set design by Derek McLane working with the lighting design Peter Kaczorowski and sound design by Brian Ronan, (and what a beautiful sound system was heard at the Performing Arts Center), plus the costume design by Alejo Vietti all meld together bringing an evening of first rate entertainment. In addition to the above just add the songs of Gerry Coffin and Carole King plus those of Barry Mann and Cynthia Wells such as “So Far Away”, “Will You Love Me Tomorrow”, “One Fine Day”, “On Broadway” plus 22 others climaxing with “(You Make Me Feel Like (A Natural Woman”, the title tune and “I Feel The Earth Move” and you have a glorious 2 hours and 25 minutes in the theatre. The book by Douglas McGrath follows the formula of musicals but has a cast that takes old, very old, musical comedy lines and makes them sound fresh. When Suzanne Grodner, as Genie Klein, Carole’s mother, can make a character who insists her daughter become a teacher and ‘stop the foolishness’ of writing songs and then when her daughter becomes a huge success takes all the credit sound so fresh and funny you know you are in a comfortable place. The story follows the insecure Jewish teenager from Brooklyn who sells her first song when in her teens to the self assured woman who commands the stage at Carnegie Hall in 1971 to a sold out concert. We watch Carole Klein become Carole King as she meets Gerry Goffin, falls in love with him, writes the music to his lyrics, has his child and marries him. Gerry is a womanizer and, in all probability, bi-polar who has wild, various mood swings, when faced with the latest woman in his life Carole decides to leave him. Abby Mueller is excellent as Carole Klein/King with a powerful voice whether singing alone or with others and handles the intimate scenes at first tentative as a teenager would and then morphing into the major star we know as Carole King. Liam Toby, as Gerry, has a more difficult role of making the audience like this man who betrays his wife and succeeds in doing just that including the corny, but touching, ending. Their duets together and the songs they sing solo are delights to hear. Becky Gulsvig, as Cynthia Weil, and Ben Fankhauser, as Barry Mann, are real life songwriting competitors and friends of Carole and Gerry and almost steal the show from them. Weil/Gulsvig is almost a stock musical comedy character that you wonder if she was/is really like that but she holds your attention from her first entrance to the her curtain call. Mann/Fankhauser makes every hypochondriac seem to be the funniest person in the room. The two have a great rapport whether singing or exchanging witty remarks especially regarding their relationship. To all this add an ensemble that reenact such singers as The Drifters, The Shirelles, Little Eva and The Righteous Brothers belting out songs in 1960s style and outfits and you have a winning show. This is one of the best touring companies presented by Bank of America in their 2015-2016 Broadway Across America shows. “Beautiful-The Carole King Musical” will be at in Fort Lauderdale until May 10th and will return to the Arsht Center in Miami February 14, 2017. Go towww.beautifulonbroadway.com/tour to see when it is coming to your city and get tickets! Running time 2 hours and 25 minutes including a 20 minute intermission.